How do cars move? Here we will find out the principles by which cars work. The driving force that moves a car is generated from an engine and electric motor. Engine technology has a very long history and has used gasoline, diesel and gas. An electric motor uses electricity as new technology to reduce environmental pollution and resource exhaustion. Let&apos;s find out more! We usually use gasoline, diesel and gas as fuel. These 3 fuels operate in similar ways. Gasoline engines are designed to run on fuel from the fuel tank, and its spark-plug generates a spark through electrical discharge. 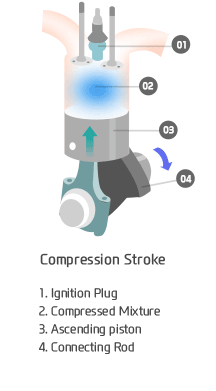 When it explodes, the pressure pushes piston downwards and generate energy by back-and-forth motion. 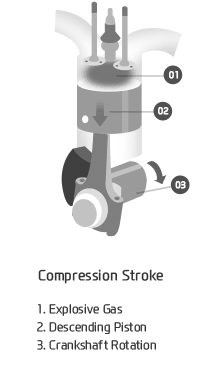 The energy is delivered to the crankshaft, and this causes rotatory power that can move a car. 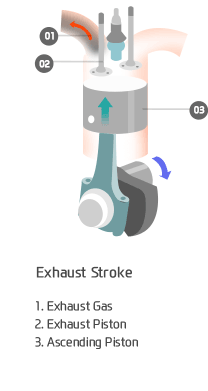 Diesel also has the same process as gasoline, but there is no spark-ignition device required. A natural explosion by is caused by increasing the heat. Gas engines have the same driving principles as gasoline. Cars using gasoline, diesel and gas as fuel contaminate the environment with their emissions. To resolve the problem, Hyundai developed a hybrid car which uses both an engine and electric motor. The electric motor is operated when the car starts to move, engine and electric motor work in combination when driving on a flat road, and electric energy from the battery will help the car to drive up a slope. When driving downhill, the engine is stopped and the battery is recharged by collecting energy. 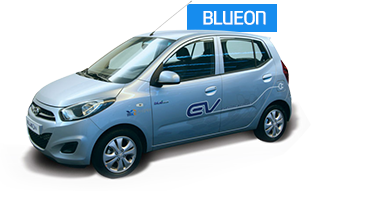 The hybrid car is also called as environmental car as it is able to reduce toxic gas by over 90% compared to existing cars as their number increases. It does not use fossil fuel but moves the car by providing electric energy from a high-voltage battery to an electric motor. It applies the principle of operating the motor by recharging the battery, and this results in a reduction of air pollution due to exhaust gas and helps conserve scarce oil resources.